Hungry locals and visitors know that Richmond offers a hot and heaping buffet of great-value food courts. From the polished and expansive options at Aberdeen Centre and CF Richmond Centre to the fancy-free, hawker-style counters at Parker Place and President Plaza, you could easily spend a few days enjoying your favourite dishes here. But if you’re still searching, why not unfurl your restless appetite at Yaohan Centre? 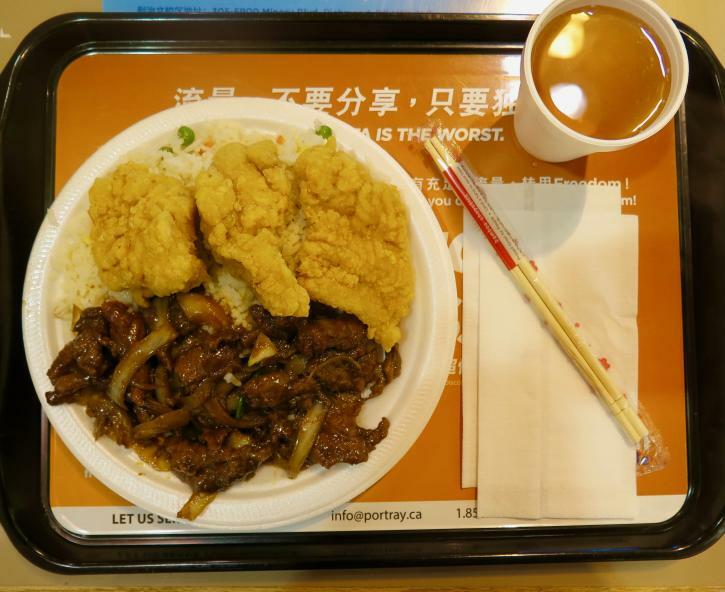 A five-minute walk from the Aberdeen Canada Line Station, one of the city’s oldest Asian malls has a chatty food court with a kaleidoscopic array of counters. From Chinese to Korean to Malaysian dishes, the trick is to gather several shareable plates and dive in with a few friends at your table. Read on for details on some of the enticing stands we found on our recent visit. There’s fierce competition between the three Chinese combo stands arrayed alongside each other here, each with friendly servers inviting you to order as soon as you glance in their direction. You can’t go wrong at any of them—especially if your stomach is growling and you have $8.99 (two items plus rice) or $9.99 (three items plus rice) to spare. Golden Rice Bowl (and the stands flanking it on either side) offers 20 or so trays of glistening, fresh-prepared choices ranging from pepper beef to deep-fried tofu to panko-crusted fish. Don’t miss: the wallet-friendly combos, which are a good option if you’re in a hurry and you only have time to order from one of the counters at Yaohan Centre. Golden Rice Bowl’s heaping combos also come with a cup of Chinese tea. The juicy Hainanese chicken and rice set meal is popular at Curry House—just look for the green-hued stand with the jaunty-looking rooster sign. 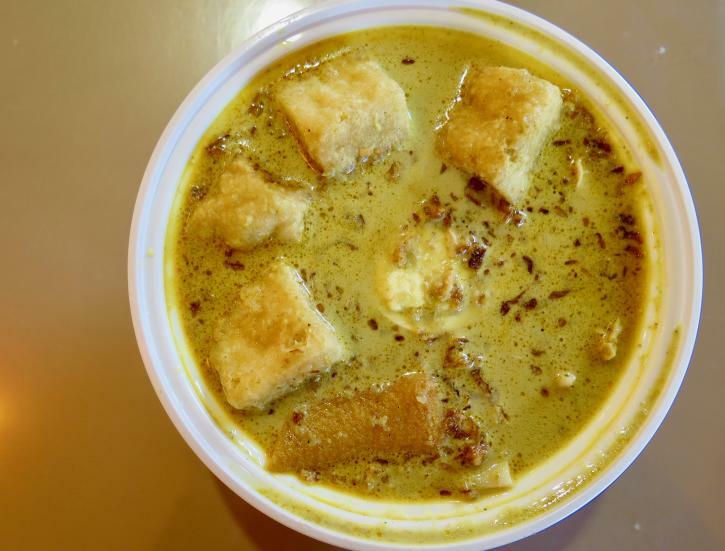 But Malaysian curry fans also love the hearty, nicely spiced meat curries here: the beef version is a rich, tasty top-seller that’s an ideal fortifier on chilly winter days. Need something to mop up your leftover curry sauce? Nip across to Wah Yuen Noodle House for a slightly salty $2 Chinese doughnut; it’s the perfect sauce sponge. Don’t miss: the spicy laksa is a deliciously brothy bowl of chicken and fried tofu chunks swimming with noodles and crunchy beansprouts—a great way to clear your cold-season sinuses. Topped with half a boiled egg, it’s a standout dish at Yaohan Centre. Countryside Chinese Noodle Restaurant is a popular mom and pop stall with a home-style, Northern Chinese approach, the illuminated wall menu here is written in Chinese characters—but there are lots of handy photos of the dishes to peruse. For such a small stand, there is a surprisingly large array of options, from braised pork with rice to duck egg with pumpkin. Give yourself plenty of time to check out your choices…then order a couple of dishes to share. Don’t miss: the pork, beef or vegetable dai bao buns. 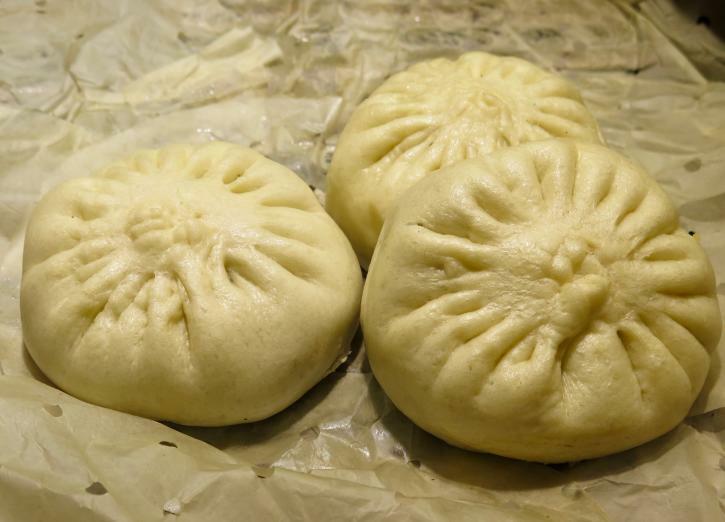 Next to the register, you’ll often spot some large bamboo steamers filled with these giant buns. These soft, warm treats are almost bursting with fillings and are a delicious addition to any Yaohan visit (or a great take-home treat). The battle over Richmond’s best Chinese barbecue counters continues at Datang BBQ Express, where several brawny men work behind the counter to prepare and chop the glistening cuts of duck, pork, and chicken that are housed in the steam-streaked, glass-enclosed display case. 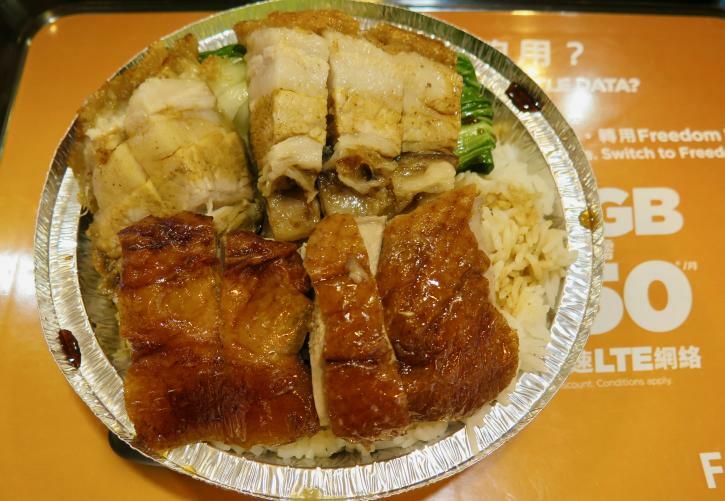 There are several options for hungry carnivores here, with crunchy-skinned roast pork and shiny, velvet-soft duck among the stand’s irresistible choices. Not sure which meat to try? Combo dishes are also available here. Don’t miss: the duck and roasted pork combo. Served on a bed of rice with sliced bok choy—although your tin foil dish will be topped with so much meat that burrowing down to the rice takes a while—this is a good dish to share with friends. Yaohan has several colourful dessert and bubble tea counters. But this traditional-looking stand—complete with an ornate cauldron and a seating area of carved wooden tables—lures lots of curious visitors. There’s a vast array of desserts at Fook Po Tong, including a huge selection of jelly-based choices ranging from green bean with kelp to almond with white jelly fungus. Many dishes claim medicinal or health-giving properties and, if it’s your first time, you can peruse the panels of photos and English-language descriptions to make your selection. Don’t miss: the papaya and white jelly fungus, which is a good entry-level dessert for newbies. 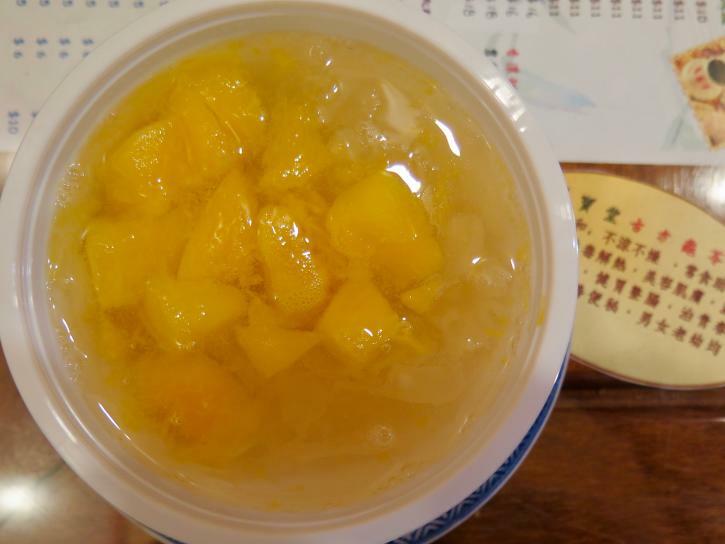 Served hot or cold (our server said it’s often preferred hot), it’s a subtly-sweet and filling bowl that’s swimming with fruit and opaque jelly chunks. Some Yaohan Centre food court stands are cash-only, so make sure you bring money with you. English is well-spoken at most stands and many menus have handy English translations. Weekend lunchtimes can be busy here but tables are usually easy to come by, especially on weekdays. During your visit to the mall, save time to check out the busy supermarket located just a few steps from the food court. A culinary hot spot for locals and visitors, it has an excellent array of freshly-prepared hot food as well as shelves of authentic ingredients for those who fancy preparing their own Asian dishes at home.